"...not in device or creed..."
Looking for a Christmas present idea? You don't have to read much about the Covenanters to be humbled by their utter commitment and sacrifice. So these lyrics hold true today like no other generation before. For all our decadent wealth - and our greed for even more - what right do we have to "flowery beds of ease" when our forefathers "sailed through bloody seas" - and many believers around the world are being persecuted at this very moment? William Cleland was just 17 years old during the Covenanters battles of 1679 at Drumclog (where the Covenanters defeated "Bluidy Clavers" - Graham of Claverhouse), where Cleland was an Officer of Foot and was instrumental in the victory. He also fought as a Captain at the Battle of Bothwell Brig where he was a Captain, but where the Covenanters were defeated. 1. At the top in gold Hebrew script it reads "Jehovah Nissi" which translates as "The Lord is My Banner" - a quote from Exodus 17 v 15, where during a great battle that the Israelites were fighting against the Amalekites, they were assured of the victory as long as Moses held his arms aloft. As he grew tired, his brother Aaron and Caleb's son Hur held his arms up for him. 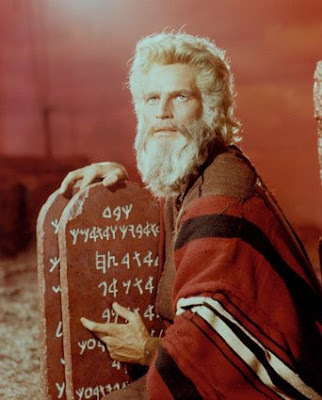 After the victory, Moses built an altar and called it "Jehovah Nissi"
3. At the bottom in red type it says "No Quarters for Ye Active Enemies of Ye Covenant"
Cleland gave the banner and his sword to his friend Henry Hall of Haughhead at an unknown date, to prevent them falling into the hands of the enemy. 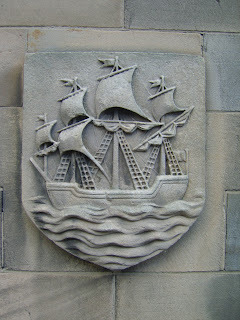 The items were passed down the generations to several zealous Covenanters until they reached the hands of the Raeburn Family from East Lothian, and were discovered by a Mr James Drummond around 1850. The banner eventually came into the possession of the regiment at a later date. The banner can today be seen on display at the Cameronians Regimental Museum in Hamilton, Scotland. Postscript:William Cleland later joined a Covenanter regiment fighting for King William III, but was killed at the Battle of Dunkeld in August 1689. A book of his poetry was published in 1697, including one entitled "On the clergie when they met to consult about taking the Test in the year 1681" - I've not read it, but must be a comment on the "Test Oath" which was forced upon the clergy in July 1681, to place the King in supremacy over the Church. (Sorry about the recent outage roon here.) I'm going tae be changin a wheen o things on the blog - the name and the address for starters. 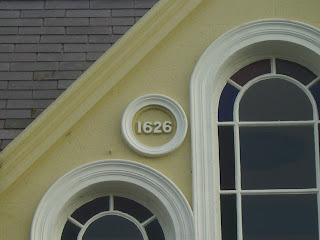 So far am thinkin about "1606" as the new name - my favourite year in Ulster history as it was the year that Hamilton & Montgomery brought Scottish people to the Ards Peninsula in large numbers. Any suggestions will be gratefully received. I'll set up a forwarding thing to redirect readers from this address to the new yin once it's all set up. It's funny how much we just accept as we're growing up. We don't question, we just absorb and accept. It can be a long time before we start to ask questions. However, in the mid 1800s when the "Plymouth Brethren" were setting themselves up, they fully embraced a more sensationalist approach, which put a whole new interpretation on things. They made specific claims about future events, invented the term "rapture", predicted future world empires, re-wrote the whole the identity of Antichrist etc etc. These powerful and almost magnetic ideas then filtered into most evangelical churches on both side of the Atlantic, which then in turn spawned a whole raft of fictional books like "In The Twinkling of an Eye" , and more recently the mulit-million dollar"Left Behind" series. Dispensationalism is today a very big money spinner. 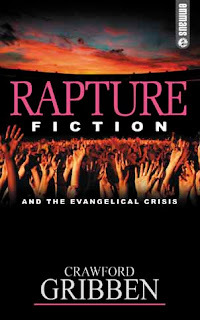 My e-Friend (we've never met in person) Crawford Gribben has a great book on the subject called "Rapture Fiction" which I can thoroughly recommend. So this Brethren world was the environment that I, and many tens of thousands of Ulster believers, was brought up in. I was enthralled. Preachers like Hedley Murphy held me spellbound for years between the ages of probably 8 and 14. Dispensational prophecy was preached solidly in Gospel Halls up and down the country. Preachers would arrive with massive home made hand painted wallcharts which were often too long for the small buildings they were preaching in, outlining the history of the world from Genesis to Revelation. Theologically these tens of thousands of Ulster believers are rock solid on pretty much everything - except prophecy. We were waiting with baited breath for the breaking news report that Henry Kissinger, then Gorbachev, then Saddam, and maybe now even Tony Blair, has revealed himself as Antichrist. Remember, that until the mid 1800s these ideas didn't exist, and biblical Christianity had survived for 1800+ years without them. Make no mistake, Jesus is coming back. But He might not be coming in the way many have been (mis)led to expect. Perhaps the whole thing is a distraction - making some Christians obsess about current affairs and trying to spot the prophetic fulfilments. Perhaps it also gives some Christians the glib opt-out of "why should I worry about the state the world is in? I'm going to be raptured out of it anyway"
So, over recent years I've begun to question these things that I soaked up. As another friend put it, I'm "rearranging my mental furniture". Any advice on good reading material from you sound Reformed believers out there would be much appreciated and will be added to my Christmas list. (Robin Fairbairn has already suggested "Windows on the World" by Liam Goligher, and "The Momentous Event" by WJ Greer. This hymn's been rattling about in my head a lot recently. As a struggling believer, trying to live each day as I should but making a mess of it and falling far far short most all of the time, I often wonder about doing "enough". Praying "enough". Giving "enough". Helping "enough". Witnessing "enough". But no matter what I do - no matter what any believer does - it's never enough. Because "enough" would imply that what Christ did for us has limits and can in some way be measured... and therefore could perhaps be repaid through our own actions and works. And that He died for me..."
"...And beyond this there lies in the ocean, turned towards the west and the north, the island of Niatirb which Hecataeus indeed declares to be the same size and shape as Sicily, but it is larger, and though in calling it triangular a man would not miss the mark. It is densely inhabited by men who wear clothes not very different from other barbarians who occupy the north- western parts of Europe though they do not agree with them in language. These islanders, surpassing all the men of whom we know in patience and endurance, use the following customs. In the middle of winter when fogs and rains most abound they have a great festival which they call Exmas , and for fifty days they prepare for it in the fashion I shall describe. First of all, every citizen is obliged to send to each of his friends and relations a square piece of hard paper stamped with a picture, which in their speech is called an Exmas-card . But the pictures represent birds sitting on branches, or trees with a dark green prickly leaf, or else men in such garments as the Niatirbians believe that their ancestors wore two hundred years ago riding in coaches such as their ancestors used, or houses with snow on their roofs. And the Niatirbians are unwilling to say what these pictures have to do with the festival, guarding (as I suppose) some sacred mystery. And because all men must send these cards the market-place is filled with the crowd of those buying them, so that there is great labour and weariness. They also send gifts to one another, suffering the same things about the gifts as about the cards, or even worse. For every citizen has to guess the value of the gift which every friend will send to him so that he may send one of equal value, whether he can afford it or not. And they buy as gifts for one another such things as no man ever bought for himself. For the sellers, understanding the custom, put forth all kinds of trumpery, and whatever, being useless and ridiculous, sell as an Exmas gift. And though the Niatirbians profess themselves to lack sufficient necessary things, such as metal, leather, wood and paper, yet an incredible quantity of these things is wasted every year, being made into the gifts. But during these fifty days the oldest, poorest and the most miserable of citizens put on false beards and red robes and walk in the market-place; being disguised (in my opinion) as Cronos. And the sellers of gifts no less than the purchasers become pale and weary, because of the crowds and the fog, so that any man who came into a Niatirbian city at this season would think that some great calamity had fallen on Niatirb. This fifty days of preparation is called in their barbarian speech the Exmas Rush. But when the day of the festival comes, then most of the citizens, being exhausted with the Rush, lie in bed till noon. But in the evening they eat five times as much supper as on other days and, crowning themselves with crowns of paper, they become intoxicated. And on the day after Exmas they are very grave, being internally disordered by the supper and the drinking and reckoning how much they have spent on gifts and on the wine. For wine is so dear among the Niatirbians that a man must swallow the worth of a talent before he is well intoxicated. Such, then, are their customs about the Exmas. But I myself conversed with a priest in one of these temples and asked him why they kept Crissmas on the same day as Exmas; for it appeared to me inconvenient. But the priest replied, It is not lawful, O Stranger, for us to change the date of Crissmas, but would that Zeus would put it into the minds of the Niatirbians to keep Exmas at some other time or not to keep it at all. For Exmas and the Rush distract the minds even of the few from sacred things. And we indeed are glad that men should make merry at Crissmas; but in Exmas there is no merriment left. And when I asked him why they endured the Rush, he replied, It is, O Stranger, a racket ; using (as I suppose) the words of some oracle and speaking unintelligibly to me (for a racket is an instrument which the barbarians use in a game called tennis ). But what Hecataeus says, that Exmas and Crissmas are the same, is not credible. For the first, the pictures which are stamped on the Exmas-cards have nothing to do with the sacred story which the priests tell about Crissmas. And secondly, the most part of the Niatirbians, not believing the religion of the few, nevertheless send the gifts and cards and participate in the Rush and drink, wearing paper caps. But it is not likely that men, even being barbarians, should suffer so many and great things in honour of a god they do not believe in..."
Their hearts are a leprosy under their claes. Secure them a passport wha enters His Rest? I'm pretty sure this is from a book called "Poems From College and Country by Three Brothers" published in 1900. Thomas and his two brothers Patrick and Samuel Fee were from Cullybackey. There are easily dozens of different flag designs on lampposts here every summer, claiming all sorts of allegiances and territories. Here's another one, from the cover of a great wee book I bought lately on eBay. It was published in Virginia in 1905 and has small chapters summarising the various periods of the Covenanter story between 1638 and 1688. 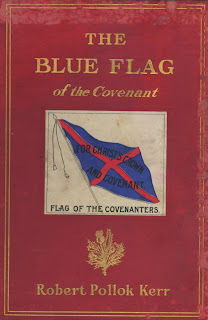 The Covenanters had a selection of flags, many of which still survive in museums. They tend to be based on the Saltire or Cross of St Andrew, with the message "For Christ's Crown and Covenant" and sometimes include pictures of the Bible and other messages too. This wee book's final chapter is called "Victory! The Revolution of 1688". It says "...they boldly declared for William of Orange, and were the first volunteers in all Britain who appeared in arms, for the glorious Revolution of 1688, by which the nation gained those liberties which have been its boast to this day. All honour to the brave Cameronians. They did not wait to see which would be the stronger side, but proclaimed at once, to all the world, that they were for William, the Protestant King..."
Here's a great way to spend a tenner. 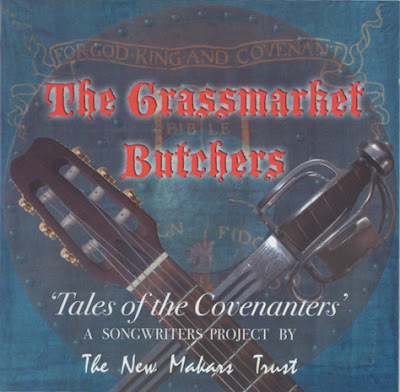 "The Grassmarket Butchers / Tales of the Covenanters" is a cd of 13 songs, all written by contemporary Scottish singer/songwriters. My good friend David Scott tipped me off about this CD a few months ago, so I ordered a few copies and have hardly stopped playing it since. Really good stuff, mostly acoustic, mostly male vocalists. It was produced by the New Makars Trust in 2005. For soon the Covenanters would be comin efter him! 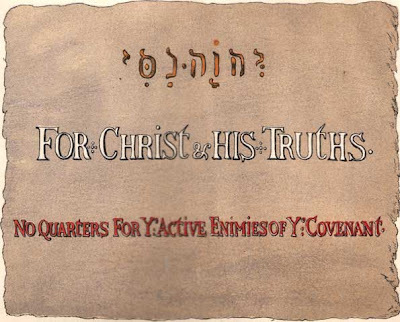 This song is from the old Seth Sykes hymnbook "Songs of Salvation" from the 1920s - the same hymnbook as "My Sins are A' Awa". Sykes is best know for writing "Thank You Lord for Saving My Soul". This old song is just another example of how powerful the Covenanter experience has been to the Scottish psyche over the centuries since 1638. Click on the graphic to get full-size music notation. Let me know if the tune's any good! A new bishop, Henry Leslie, arrived in Ulster in July 1636. He was opposed to Presbyterianism and so he summoned the young Rev James Hamilton and four other ministers to meet with him in private, to discuss their refusal to use the Service Book of the Established Church. Leslie couldn’t persuade them to dilute their principles. So on 10th August 1636 he summoned them to a meeting in Belfast, where he put it to them that he would hold a public meeting the next day in the church in Belfast. Perhaps to Leslie’s surprise, the five ministers accepted the challenge. They selected the young Hamilton to speak on their behalf. He stood before the gathered audience of nobility, gentry and clergy, and spoke with “great readiness and acuteness” during a debate which lasted several hours. Bishops Leslie and Bramhall, frustrated, stopped the meeting and adjourned - two days later on Friday 12th August 1636, the bishops pronounced against the five Presbyterian ministers and deposed them from their churches. It was no surprise to Hamilton - the Ulster-Scots had seen this coming for some time. In fact, over two years before, some of the Ulster-Scots Presbyterian ministers had been suspended from their churches, and so they wrote to the Puritans in Massachussetts. Rev John Livingstone wrote to John Winthrop, Governor of Massachussetts, in July 1634, to find out about the possibility of the Ulster-Scots being welcomed in the New World; Winthrop’s son visited Ulster in January 1635 and encouraged the Presbyterians to come to America. A few days later ALL of the Presbyterian ministers in Ulster were deposed. They had already been planning to sail to America. The pressure on them was now so great that on 9th September 1636, Rev James Hamilton of Ballywalter, Rev Robert Blair of Bangor, Rev John Livingstone of Killinchy and Rev John McClelland of Newtownards set sail from Groomsport with 136 of their congregation. Also on board was John Stewart, the Provost of Ayr. As all of you know, “Eagle Wing” didn’t make it. 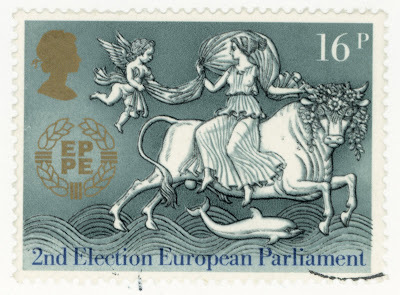 She returned home, having sailed about 1200 miles across the Atlantic and 1200 miles back, on 3rd November 1636. Defeated and scorned by the Bishops, the four ministers went back to Scotland. Rev James Hamilton moved to Dumfries where he was minister for ten years from 1636 – 1646… a time when Scotland rose up in rebellion against the King on 28 February 1638 with “Scotland’s National Covenant”. You know the rest! Hamilton and his three colleagues (Rev Adair from Ayr / Rev Henderson from Dalry / Rev Weir of Dalserf) arrived at Carrickfergus by the end of March and visited almost every town in Ulster – Belfast, Comber, Newtownards, Bangor, Holywood, Ballywalter, Broadisland, Derry, Raphoe, Ramelton, Ballyshannon and Enniskillen – administering the Covenant to the people and holding national days of repentance for those who had rejected the Covenant previously and had taken the “Black Oath”. Hamilton spent much of his time back at Ballywalter, renewing friendships with the kinsfolk he had been forced to leave behind 8 years before. Their Covenanting mission was completed. On Sunday 2nd July 1644, having preached in Donaghadee that morning on Hebrews chapter 12, Hamilton and Weir were sailing back to Scotland when the ship was captured by supporters of Sir Alexander MacDonnell (the Lieutenant General of Montrose’s anti-Covenanter army). They were held hostage for almost a year in Mingary Castle on the peninsula of Ardnamurchan, near Tobermory (shown above). Weir died on 16th October, but Hamilton was eventually freed on May 2nd 1645 in an exchange of prisoners and lived out the rest of his life ministering in Dumfries and Edinburgh. He was appointed by the General Assembly as one of the King’s chaplains when he was again taken prisoner – this time at Eliot in Angus, north Scotland, by General Monck’s army. Hamilton was then moved to the Tower of London where Oliver Cromwell held him captive for two years before releasing him. In 1648 Hamilton and James Guthrie were tasked by the General Assembly to draw up an account of the duties of church elders (Guthrie was hanged and beheaded in Edinburgh in 1661). Hamilton returned to Edinburgh, and made at least one journey back to Ulster – he presided as Moderator in a meeting of the Presbytery of Bangor on 25th May 1664. He died in Edinburgh on 10 March 1666, leaving 5 children, one of whom – Archibald Hamilton – became minister at Benburb and Killinchy. His daughter Jane married another Archibald Hamilton, minister of Bangor. His mentor, Rev Robert Blair, died on 27th August of the same year, aged 73. I don’t know for sure where Rev James Hamilton was buried - it may have been Canongate Kirkyard in Edinburgh. I hope he has a memorial or headstone somewhere in Scotland. After all, it’s not a bad life’s work… for a Ballywalter man! The new Scottish settlers had by now more or less taken over east Ulster and had done a fine job in farming the land, building villages, homes and harbours. But the ancient church buildings (small by today's standards, stone and originally built by the Anglo-Normans in the 1200s) had been confiscated by King Henry VIII around 1540 and were then burned down in the 1570s by Sir Brian O’Neill. 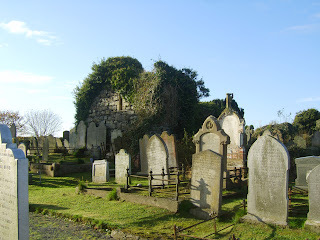 Sir James Hamilton and Sir Hugh Montgomery (by this time they were Viscount Clandeboye and Viscount of the Great Ardes respectively) began a remarkable series of church restoration projects when they arrived in 1606, and the coastal village of Ballywalter was next on the list. So the ruined church of “Whitkirk” or Whitechurch was to be rebuilt. The “Low Country” of the Ards Peninsula was to have a restored church - therefore it also needed a minister. That's today's Whitkirk/Whitechurch in the photos above - set in a flat area of land overlooking the Scottish coast (look closely at the pic). There's not much of the church left today, which is probably what it looked like in 1626 before it was rebuilt. There are even three 13th Century Anglo-Norman graves still there today. Just about 9 miles up the road in Bangor was Rev Robert Blair, who was described in a biographical booklet recently published by the Presbyterian Historical Society as “the leader of the Ulster-Scots”. Sir James Hamilton was a member of Blair’s church – today known as Bangor Abbey, and lived just up the hill (on the site of what is today the Town Hall). But young James felt compelled towards the church. He attended Bangor Abbey and was an assistant to both Blair and Rev Robert Cunningham of Holywood (from my last post). Young Hamilton continued to develop his spiritual interests in secret. “…An honest and godly young man, being a daily hearer of Mr. Robert Blair, showed much tenderness and ability. He being then chamberlain to the Lord Claneboy, his uncle, Mr. Blair, and Mr. Cunningham, (the then minister of Hollywood,) put him to private essays of his gifts, and, being satisfied therewith, Mr. Blair invited him to preach publicly at Bangor, in his uncle's hearing, he knowing nothing till he saw him in the pulpit, (they fearing my lord would be loath to part with so faithful a servant). But, when my lord heard him in public, he put great respect upon him the same day, and, shortly after, entered him unto a charge at Ballywalter, where he was painful, successful, and constant, notwithstanding he had many temptations to follow promotion, but was graciously preserved from these baits, and made a successful instrument in the work of Christ in these parts." "Being satisfied with his gifts, I invited him to preach in my pulpit, in his uncle's hearing, who, till then, knew nothing of this matter ; for, Mr. Hamilton, having been his uncle's chamberlain, and chief manager of his affairs, we were afraid the Viscount would not part with so faithful a servant. But he, having once heard his nephew, did put more respect on him than ever before. Shortly thereafter (about the year 1625. ), Mr. Hamilton was ordained (by Bishop Echlin) to the holy ministry at Ballywalter, where he was both diligent and successful, and notwithstanding he had many temptations to espouse episcopacy, and might easily have obtained promotion in that way, yet the Lord did graciously preserve him from being ensnared with those baits, and made him very instrumental in promoting His work." Rev John Livingston, described Rev Hamilton as "a learned and diligent man," and that "his gift of preaching was rather doctrinal than exhortatory." Rev James Hamilton has no “formal” memorials. 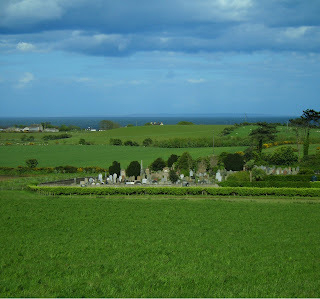 Today, Whitechurch graveyard surrounds the remains of the old church where young Hamilton preached. 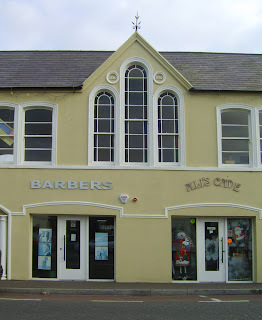 And just about a year ago, an old building – a former Presbyterian church hall – in Ballywalter main street was being refurbished to become a new community centre (with some small shop units on the ground floor). In cleaning the old building they discovered a datestone high on the front wall. 1626 – a small but important memorial of the arrival of young Hamilton at Whitkirk. But this is just the start of the story, for young James’s life is a tale of persecution, failed emigration, exile… and then a triumphant return. Robert Cunningham was one of the early Presbyterian ministers to arrive in Ulster. He came across from Scotland in 1615 to minister to the people who'd come as part of the Hamilton & Montgomery Settlement which had begun in May 1606, and was the minister at Holywood. He later married Hugh Montgomery's daughter Isabel. 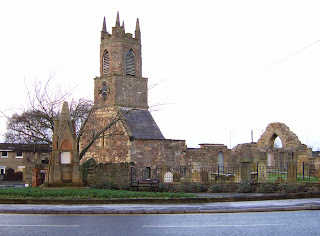 The old church he preached at is shown here - today known as The Old Priory - and it has a graveyard nearby where many of the Bruces are also buried. Cunningham had one concern in life. Too many people thought highly of him. This worried him greatly. "...Robert Cunningham of Holywood... coming to Ulster, he was ordained by Bishop Echlin in 1615 and appointed curate of Holywood. Livingstone says he was 'the one man to my discerning, of all that ever I saw, who resembled most the meekness of Jesus Christ in all his carriage, and was so far reverenced by all, even the most wicked, that he was oft troubled with that Scripture "Woe to you when all men speak well of you"...'"
Cunningham is the absolute opposite of our outlook today. We pursue popularity and acclaim from others - Cunningham was alarmed by it. He died at Irvine, Ayrshire, on 29th March 1637, saying on his death bed "...I see Christ..."
I bought this in Scotland last week and it's magnificent! I got a Broons or Oor Wullie annual every Christmas when I was wee. For those of you who don't know The Broons, they are a traditional old-fashioned Scottish family who've been appearing in a comic strip in The Sunday Post since the 1930s. Lots of great Scots language too. The Broons are to Scotland what TinTin and Asterix are to France. 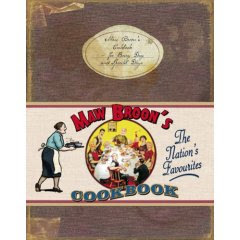 The cookbook is a masterpiece of graphic design and is full of sweet, buttery, red meat traditional recipes - all great stuff! So it'll be no surprise to you to hear that the Food Police are already complaining about the book, but it's been supported by folk like Gordon Ramsey and Ewan MacGregor. Nutritionists change their minds every week anyway - last week it was bacon and red meat that will kill us, next week it'll be mayonnaise. And be careful with the peanut butter, it may contain nuts. One of the opponents of the book, the hilariously named Professor Mike Lean, the Head of Human Nutrition at Glasgow University, says that the recipes are "potentially lethal"! 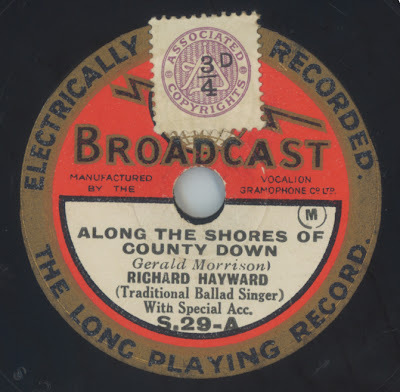 Here are two more old tracks from an 8" 78rpm I got recently - once again by Richard Hayward (pictured here). 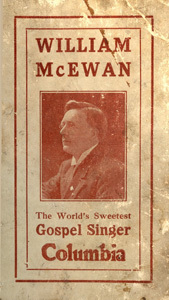 The tracks are "Along the Shores of County Down" and "The Bard of Armagh". The Vocalion record company introduced its "Broadcast" label in July 1927 and continued producing 8" records until June 1931. Listening to these now, they sound a bit overly sentimental and contrived - especially the spoken narrative in the middle of "Along the Shores of County Down". But there's an innocence about them too - they're from a bygone generation. "The Bard of Armagh" is often said to be the inspiration behind the famous American song "The Streets of Laredo", and uses more or less the same tune. Hayward was an interesting character. He was a renowned travel writer, theatrical writer, actor and folk singer, with a particular specialism in the speech and customs of Ulster. He recorded from 1925 until his death in a car accident in 1964, making over 100 records, mainly of traditional Ulster and Irish folk music, including a very famous collection of Orange ballads. There's a Richard Hayward Archive in Belfast Central Library. (PS - adding audio to your blog is easy. A few months ago I posted here about the Covenanter hero Alexander Peden and his memorial in Glenwherry, County Antrim. Last weekend I was in Ayrshire and tracked down his grave in Cumnock. It's right at the entrance to the old graveyard (not the new one). "Here lyes David Dun and Simon Paterson who was shot in this place by a party of Highlanders for ther adherance to the Word of God and the covenanted work of Reformation. 1685"
"...In 1687 John Murchie and Daniel Meiklewrick were pursued by soldiers. They were found to be carrying Bibles, and were shot without trial, their bodies being left where they lay..."
And just a few miles from there, in St John's of Dalry, there's a modern sculpture which commemorates a number of Covenanters, specifically "...two Covenanters, John Grierson and Robert Stewart, who paid the ultimate sacrifice..."
On one of the panels beside the sculpture, it says: "the south west of Scotland and Ayrshire were the parts of Scotland that suffered most severely during the troubles of the Covenanting times. This unhappy period of history came to an end with the "Glorious Revolution" in 1690, which brought William of Orange and Mary Stuart to the throne, and re-established the Presbyterian Church in Scotland..."
Which makes me think that, for all the summer activities there are around the 12th July each year - both in Northern Ireland and Scotland - that it would make sense for those events and activities to be about the freedoms and liberties secured by the Glorious Revolution, and not just about the single military victory at the Boyne? Too much of the history of our wee part of the world has been reduced to an "Ireland-only" history and has been wrongly stereotyped as always being nothing other than a sectarian "Protestant v Catholic" history. Perpetuating these narrow visions will only perpetuate our problems. Broadening our view will also broaden our minds, and will make us all far more aware of deep aspects of our heritage that have almost been forgotten. The Covenanters' story is one of committed faith and principles, of opposition to tyrannical rulers, and of the ultimate sacrifice. We have much to learn from those who went before. And in later life as I progressed into bluegrass, the acclaimed Grammy winner Alison Krauss never really did it for me either. I could certainly appreciate her talent and musicianship, but I like my old-time music to be rawer and simpler than the Krauss polished stuff. Each to their own - it's all down to individual taste I s'pose. 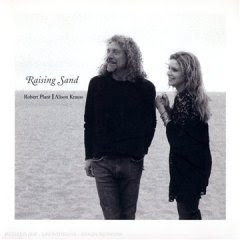 So it was a surprise this morning to see Robert Plant and Alison Krauss on BBC Breakfast Time TV, promoting their new joint album "Raising Sand". You can listen to it all online at their website here. Just click on the "Listen to Album" button at the top. It's pretty good stuff... the harmonies are great... or maybe I'm just getting mellower in my old age. One of the most hurtful things in life is to be falsely accused of something. Sometimes it happens as a result of a genuine misunderstanding and can be dealt with and set aside. In other situations allegations are made that are just lies - or that are a cynical and deliberately distorted version of the truth. The Louvin Brothers wrote a brilliant song about this called "That's All He's Asking of Me" back in the 50s. The vocals (Ira Louvin on lead, Charlie Louvin on high harmony) are close to perfect for the genre. 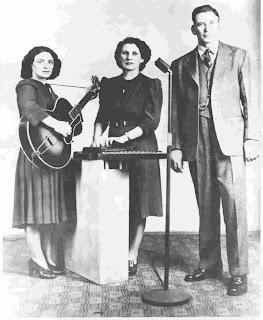 A large proportion of the Louvin Brothers' material was gospel music, but Ira became an alcoholic - he was wracked with guilt because he believed that earlier in life God had called him to be an evangelist, but he turned his back on the calling. (You could argue that by becoming a gospel singer who had enormous secular success far beyond his own lifetime, Ira Louvin became a far more effective preacher, reaching maybe millions of people with his message, than if he'd become a pulpit-based preacher). Sadly Ira was killed in a car crash in 1965. When they falsely accuse me - and others believe. And that's all that matters to me..."
Hope you enjoy the song - just press the play button below. 3) to see if I can share with you all the sort of traditional Ulster folk & gospel music I grew up with, and which is now in many cases long-disappeared. This is a version of the old Ulster-Scots folk song "The Muttonburn Stream", written by William James Hume, about a wee river near Ballycarry in County Antrim, sung here by Richard Hayward (1892-1964). This is from a crackly old 78 that I digitised a few days ago. Clarence Larkin's drawings and charts are never far wrong. 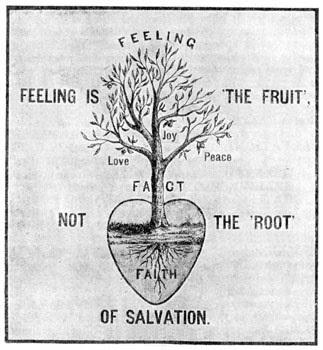 "Feeling is the Fruit - not the Root - of Salvation". Feelings and emotions can take us away from the simplicity of the gospel message. Here's a personal example. About 15 years ago when I was a student and living in a wee red brick terraced house in Belfast, one Sunday morning I got invited to go to a church I'd never been to before. It was the "cool church" of its generation, very trendy and groundbreaking. I'm sure there were and are some great people there. It still exists, but I'll not mention it by name. Bear in mind that this was in pre-"Ceasefire" Belfast, and the area the church was in was an interface flashpoint where tensions had been stoked up. So... imagine my surprise when as the service got underway, they said that the "praise group" (which was then a very new concept to me!) was going to play the Orange song The Sash... but that they were going to "redeem" it. I was stunned. Not by the music, but by the misuse and devaluing of the idea of "redemption". You see, in the world I grew up in "redemption" is the singlemost important spiritual experience in our lives, the restoring of the relationship between God and humanity, through personal individual faith in the death and resurrection of our Lord Jesus Christ. Redemption brings about forgiveness of sins (both past and future sins), brings a new nature (which from the point of salvation onwards is in a constant daily struggle with the old nature), leads to ongoing sanctification throughout our lives and results in eternity in the presence of God. But, for these people in this trendy church, redemption was just another bit of "community relations" speak. Jesus Christ did not die on the cross to teach us to be nice to each other. "The Son of Man is come to seek and to save that which was lost" - Luke 19 v 10. If anyone wants to redeem The Sash, or indeed any other secular song, they can do so by changing the words - from a story about an Orangeman going to Scotland and coming home again to Dromore - to a great old-time gospel hymn with the clear message of Christ and salvation at its core. So years later, with this whole bizarre experience still ringing loud in my memory, the Low Country Boys redeemed The Sash on our first cd - we recorded the hymn "What a Friend We Have In Jesus" (written by Ulsterman Joseph Scriven) to its famous tune. Don't get me wrong, improved community relations would be a good thing. I'm not criticising the people at that church - I'm sure they were motivated by the best of intentions, and in the few visits I made there I was warmly welcomed. But for me they missed the point. Redemption is our greatest spiritual urgency, it transforms lives. The results of real redemption are what the Bible calls "the Fruits of the Spirit" - Goodness, Meekness, Faith, Gentleness, Love, Joy, Temperance, Longsuffering, Peace. These are the characteristics of the redeemed Christian - you can read about them in Galatians chapter 5 v 22&23 - and every Christian should examine our lives to make sure we are daily living these out. That's the sort of redemption Northern Ireland needs. That's the message we should always try to present and proclaim. "...Redeemed, how I love to proclaim it! His child and forever I am..."
This name might not mean much to most of you Ulster readers, but will mean a lot to American gospel bluegrass fans. Red Shipley was the presenter of a fantastic gospel radio show in Washington DC called "Stained Glass Bluegrass" on the station WAMU 88.5FM. When Hilary and I were in DC in 1997 on our honeymoon, we listened to the programme absolutely spellbound - it was the perfect soundtrack to our Appalachian road trip. Red played loads of brilliant Country Gentlemen songs that day, and I bought 4 of their CDs as a result. I've bought many more since then! It was a MASSIVE honour when he played the Low Country Boys version of "Come Thou Fount of Every Blessing" on his show when we were at the Smithsonian Folklife Festival back in June/July. It's hard to explain what that meant to me. It's a bit like the gospel bluegrass equivalent of being on "Top of the Pops". I'm sure we have Mary Cliff to thank for that airplay - Mary was one of the presenters at the Festival, and a presenter at WAMU as well. Red Shipley retired from the show in September, and sadly died earlier this month. Thanks to Denise Graveline for letting me know about his passing. So in some ways it's significant for me that the man whose show inspired me so much back in October 1997 should both retire and then pass away in October 2007 - at the same time that I decide to take a year off from playing live so that I can have some more family time with Hilary and the kids. All good things must come to an end... for a wee while anyway. "Some glad morning, when this life is o'er, I'll fly away..."
(PS: Stained Glass Bluegrass is now on Bluegrass Country - it broadcasts over the internet each Sunday afternoon (UK time), so if you register online you might be able to enjoy some good Scotch-Irish hillbilly gospel from our American kinsfolk as you clear up the Sunday lunch dishes! Was out last nicht wi' Loughries Historical Society in Newtown, doin a wee talk about King Robert the Bruce. He's probably Scotland's most famous king, who came to the Scottish throne thanks to the achievements of William Wallace (I'm sure you've seen Braveheart!). Bruce's mother owned huge estates in Co Antrim, his wife was the daugher of the Earl of Ulster, and his wee brother Edward became High King of Ireland. 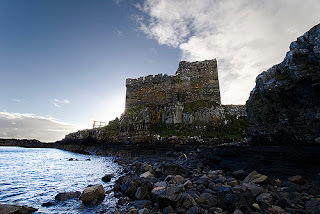 Bruce himself hid on Rathlin Island for about 6 months in 1306/1307. Another great Ulster-Scots icon. Well, Mark Anderson was doin a great quiz showing oul photographs of streets in Newtownards, and the audience had to guess the name of the street. I got ZERO points! I had to explain that, being a country boy, I was at a great disadvantage in a street quiz. Ballyhalbert only has two streets, one along the shore and one that goes inland - even a blind man has a 50/50 chance when doing a Ballyhalbert street quiz! One of the streets - Francis Street - used to be called "The Broad Road". When the question came up, nobody had a clue, but Jack answered "I don't know where it is, but it leadeth to destruction!" I had a great laugh at this - a quick scriptural quip always tickles me - it was of course a reference to Matthew 7 v 13 "...Enter ye in at the strait gate: for wide is the gate, and broad is the way, that leadeth to destruction, and many there be which go in thereat.."
"...Brother and Sister Ray seemed honest and so earnest in song, prayer, and preaching, I couldn't help admiring them for it. They sang, I remember now after twenty-two years, "Oh, the downward road is crowded with unbelieving souls." My hair would rise when they sang it, for I knew it was the truth and that I was on the road. And then they would pray and tell the Lord that the people were lost and how they wanted to see them saved, and would ask the Lord to convict them of sin. I could see they were interested in me and I began to feel uneasy. The preaching was of such a nature that any one could understand it, and it brought up my past life and revealed the future so clearly that I decided to seek the Lord at the altar of prayer. 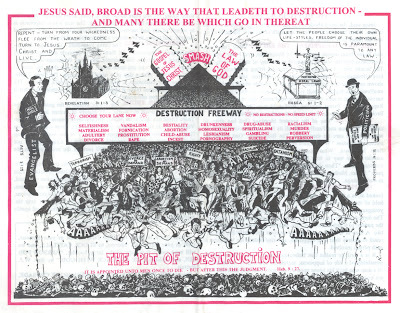 The evening I made the decision..."
Here's a scan of an old evangelical tract from the 1970s (from my da's collection) depicting the Broad Road and the Pit of Destruction. I love this old evangelical "folk art" - if you have any similar examples please scan or photograph it and email it to me. I'll upload a few more soon. Another month on the blog, and close to another 1000 visitors. Hope you're getting something helpful/useful from my ramblings! 1. 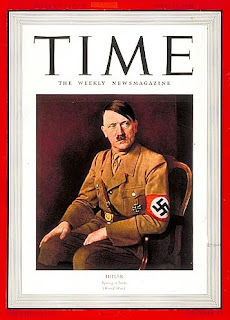 In 1938, Time Magazine's "Man of the Year" was.... Adolf Hitler!! 2. 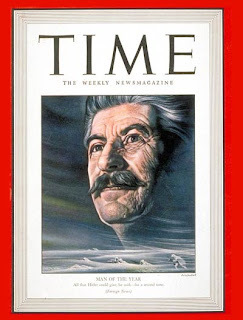 In 1939 AND 1942 Time Magazine's "Man of the Year" was.... Joseph Stalin!! Can you believe that? Arguably the most prestigious news magazine in the World voted these two mass-murderers as "Man of the Year"?!! In the years following these dubious accolades, Hitler killed 11 - 14 million people; Stalin killed 20 - 30 million!! (stats from Wikipedia). You really have to wonder what's going on in this bizarre world. I've stolen this from Stephen Jamison's blog - a fantastic image. For those readers who are in far-flung places, this is the Ards Peninsula - the Low Country - and just across the narrow stretch of water is Bonnie Scotland. The distance across is just 18 miles from Donaghadee to Portpatrick, which was the main sea route between the two countries from 1606 until 1862. When Sir Hugh Montgomery brought the first big Scots settlement across to Ulster in 1606 and established Newtownards, Scottish traders would come across every week on market day. They travelled over land to Portpatrick, loaded their goods onto boats, sailed to Donaghadee, loaded their goods onto horses and then went to Newtownards - and were back in Scotland by bedtime that same day. And during the Covenanters' times of the late 1630s and early 1640s, many Ulster-Scots Presbyterians rowed across the water to attend church services in Scotland, and then rowed back to Ulster by bedtime. This is a picture I took at Birkenhau concentration camp on Friday morning of last week. Birkenhau is 3km away from Auschwitz and is spread over 300 acres of land. 1.5 million people, the majority of them Jews, were exterminated here by the Nazis. And most of them got off the train just here. 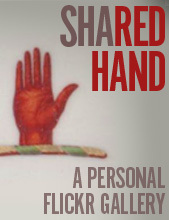 I can't tell you what an profoundly moving experience our trip was. I can't explain what it was like to see mountains of shoes, of suitcases, of clothes, and even of human hair - preserved in the museum at Auschwitz. I can't articulate what is was like to step into a gas chamber, or how it felt to stand next to two ovens in one of the crematoria where tens of thousands of people were turned to ashes just because of their faith. For all the rubbish that's being taked about a "conflict resolution centre" being built on the site of the former Maze prison near Lisburn here in Northern Ireland (which was a prison where terrorist criminals served out their sentences, and even at that in most cases only a very small portion of their sentences), a visit to Auschwitz puts our recent Troubles into stark perspective. Our tour guide told us that only about 15% of the senior Nazis were ever convicted for their crimes. About the same percentage of terrorist murders in Northern Ireland were ever brought to (a degree of) justice. The clear message of Auschwitz/Birkenau is that memorials are for the victims, not the perpetrators. Me and Graeme are taking oor da - Eric - to Poland for a wheen o days. The new direct flights from Belfast International to Katowice make it handy, so we're stayin in a hotel in the middle o Katowice town itsel. We'll arrive there aroon midnight on Thurs night / Fri mornin. The reason for goin is to take my da to see Auschwitz. So it'll no be a happy trip, and I'm sure I'll hae thochts an comments tae blog aboot yince I get back hame again, but I'm looking forward to it. My da's had a fascination with, and deep sympathy for, the Jewish people all his life, so this is probably the trip of a lifetime for him. I've noticed throughout my 35 years that many Ulster evanglical believers have a real sense of spiritual connection with God's chosen people, and a deep sympathy for their plight and persecutions. It comes from being reared on generous helpings of the Oul Testament in between the tay an soda breid. If it goes weel he's thinkin aboot takin ither folk on a repeat visit next year. We'll be back in Belfast aboot 7.45 on Saturday night, and we're hopin to get doon the road to the monthly Saturday night Gospel Rally in Carrowdore Mission Hall, to tell everybody aboot the trip. I've been a long-distance Chelsea fan since 1985. Allegedly, recently-ousted manager Jose Mourinho once said "There is God, then Jesus, then me". Mourinho is a man with an awesome sense of his own worth. 1. 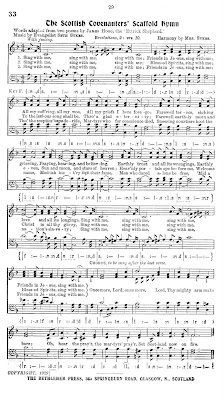 "Follow Follow, We Will Follow Rangers" is of course a rewrite of "Follow Follow I Would Follow Jesus" by William Cushing (USA), around 1878. Robert Lowry wrote the tune. 5. And I'm sure most of you are well familiar with the version of "Away in a Manger" sung at Northern Ireland matches, with the superb line "...the stars in the bright sky looked down where HEAL-Y, HEAL-Y, HEAL-Y...!" 6. "Glasgow Rangers, Glasgow Rangers, We'll support you evermore" is of course from the hymn "Guide Me O Thou Great Jehovah" - the end of its first verse is "Bread of Heaven, Bread of Heaven, Feed me till I want no more". And there are more. "Abide With Me" by Henry Lyte is still sung at every FA Cup Final in England. Maybe this list of five is due to a fair proportion of Rangers and Northern Ireland fans having been sent to Sunday School, where they learned these choruses and hymns. The tunes are simple and memorable, they're easy to sing and sound great with hundreds or thousands of voices belting them out. "...of the thirty seven clubs that have played in the English Premier League since its inception of the 92/93 season, twelve can trace their origin directly to a church...", quoted from the book "Thank God for Football"
Fenians, Orangemen, Confederates and Ulster Scots. Frank Roney (1841 - 1925) was a leading figure in the trade union movement in Belfast during the mid 1800s – he was an active member of the Friendly Society of Ironfounders, and was also a committed Irish nationalist and Fenian organiser. Roney’s family background was varied – he was a Catholic, but his mother had been raised as a Presbyterian, one of his uncles was an Orangeman, but his grandfather had been a committed United Irishman. Quite a cocktail of influences. Roney was arrested in 1867 for his Fenian activities and, after a period in prison in Dublin, was allowed to emigrate to the USA on the condition that he never return to the UK or Ireland. He became heavily involved in the union movement in the USA, and died at Long Beach, California in 1925, aged 84. A portion from his 1931 biography “Frank Roney, Irish Rebel and Labour Leader” (Univ. 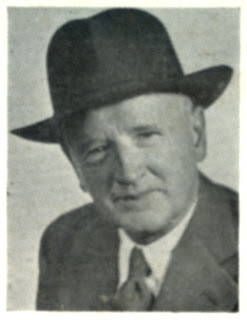 of California Press, 1931) was used by the renowned Sam Hanna Bell in his own compilation “Within Our Province – a Miscellany of Ulster Writing” (Blackstaff Press, Belfast 1972). In the book, Roney describes the scene of the arrival in Belfast of the famous Confederate steamship the CSS Alabama, presumably at some point during the American Civil War (1861 – 1865). She was by far the most successful Confederate raider of the Civil War, sinking 58 Yankee ships. There is even a famous folk song about her history and exploits called "Roll Alabama Roll". 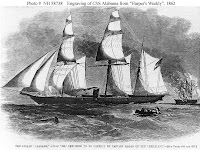 The Confederate cruiser "Alabama" put into Belfast Lough ostensibly to get provisions, but really to create sympathy for the Southern cause. The aristocracy, Orange magistracy, and men of wealth, whom we classed as the natural enemies of the Irish people, hailed the coming of the vessel, knowing her mission, as an event by which to show, in the reception given her officers, how desirous they were to see the American Republic smashed to fragments. The town put on its gala garb and with a band playing, and banners flying, the enemies of Ireland boarded a tugboat decorated with bunting, visited the ship and escorted the officers of the cruiser to the city. Carpets were laid from the gangplank of the tug to the carriages, and the sworn enemies of the American Republic were escorted to all points of interest in the city and vicinity, and feted at a banquet where every speaker delivered messages of comfort and encouragement to their Confederate guests. Bumpers were heartily drunk to the destruction of their common enemy, the United States. No Irish Nationalist could complacently accept the compliments paid these officers as the expression of Irish opinion, and when in after years many of us were forced to leave our country, we naturally attached ourselves to the Republican Party, principally because the South, whose representatives were thus feted by our enemies, was the dominating power of the Democratic Party. It’s certainly a very romantic story, and heavily loaded with political allegations. The claimed allegiances between Orangemen and the Confederates will confirm the prejudices and suspicions of some readers, and the hopes and dreams of others! But, the story is utter fiction. Roney invented the whole story, perhaps to try to stimulate pro-Irish nationalist sympathy in the USA in the early years that followed the defeat of the Confederates during the American Civil War. Equating the Confederate foe with the Orange foe in the minds of the American public would be a useful propaganda victory for him, and might secure American support for the Irish republican cause. 1) The man who commissioned the Alabama to be built was Admiral James Bulloch, Confederate Purchasing Agent based in England. For a time the British government seemed to support the Confederate effort. Bulloch's nephew was the future US President, Theodore Roosevelt. Roosevelt later persuaded Bulloch to write “The Secret Service of the Confederate States in Europe”. The Bullochs had emigrated to the New World from Glenoe in County Antrim in 1729. … At 2.30 a.m. (31st), we got under weigh, and stood out of the bay under steam alone. At 8 a.m. the ship was off the Calf of Man, the sky clearing and wind dropping. We set all sail to a middling fresh breeze, and bowled along 13 knots, good. By 11 a.m. the wind fell light, and we lost the effect of the sails; at noon passed South Rock**, and steered along the coast of Ireland. At 6 p.m. entered between Rathlin Island and Fair Head. At 8 p.m. stopped the engines off the Giant's Causeway, hailed a fishing-boat, and (George) Bond and I went ashore in a pelting rain, leaving Captain Butcher to proceed with the Enrica, in accordance with his instructions. keep his weather-eye open, and once clear of Innistrahull, there would be plenty of sea-room ; but I could not wholly shake off an occasional sense of uneasiness. 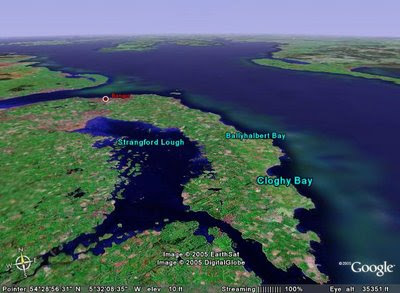 Bond gave me the exact distances from point to point, from light to light, and having been taught at school to work up all sums to very close results, I made the average speed of the Enrica to have been 12*89 from Moelfra to the Giants' Causeway, and felt well satisfied with the performance. 2) The ship that sailed from Liverpool wasn't even called the CSS Alabama. She was built by John Laird and Sons of Birkenhead in Liverpool under the codename Vessel 290, and at the time of her launch had been renamed as Enrica. Enrica was launched on 28th July 1862. 3) The ship never came to Belfast. After leaving Liverpool Enrica did however anchor briefly at the Giant’s Causeway around July 31st, where Bulloch and the ship’s pilot disembarked, stayed a while in Ulster, and then went back to Liverpool. 4) Enrica then sailed round Ireland to the Azores, where she was renamed CSS Alabama on 24th August 1862. 5) When CSS Alabama left Liverpool, she had a civilian crew. Even if she had come to Belfast there would have been no Confederate officers onboard as Roney’s account alleges. In the chapter “A Soldier of the Irish Republic”, Roney acknowledged the language spoken in the Ards. Isn't it amazing how quickly time flies by. We are so fixated by clocks, calendars, by growing up, and by getting old. What will it be like to live in a place where there is no such thing as time? Than when we first begun"
Try to get your time-limited mind around that one! 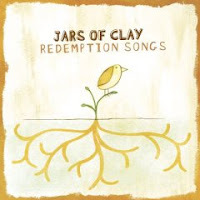 A few years ago the very cool/trendy American gospel group Jars of Clay released an album of old gospel classics called Redemption Songs. Now the style in places is - for my taste - a wee bit overdone. The dancey tempo and drumbeats, the slightly off-key melodies, minor notes thrown in where you're not expecting them, strange instruments mixed in here and there - doesnt quite do it for me. Nothing that an old pump organ wouldnt fix! Nevertheless, if you've got a spare tenner it's worth buying a copy. The words alone will lift your eyes to where they should be looking! I am bound, I am bound, I am bound for the Promised Land..."
They say that the early Scots settlers coming to Ulster in the 1600s believed they were on their way to their Promised Land. Then a century later the Ulster-Scots thought the same when they emigrated to the New World (America) - there are 83 places called "Canaan" in the USA alone. They were either being optimistic or deluded. Our promised land is not on earth. Then why should I murmur when trials are near? I long for a country by sin undefiled"
Now there are some who say that the Ulster-Scots language doesn't exist, that it's just the Scots language spoken in Ulster. The Low Country Boys have spent weekends over the last few years performing in Moniaive in Dumfries and Galloway, in Prestwick in Ayrshire, and in Fraserburgh up north of Aberdeen. And many of the folk we stayed with and got talking to were amazed by our Ulster-Scots songs and speech. Many of those same people dispute that there's even such a thing as a single "Scots" language anyway - there are significant regional differences within Scotland. There are many words and expressions used in Southern Scotland that aren't used in North East Scotland, and vice versa. 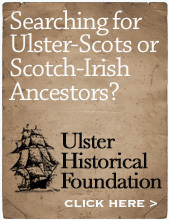 One of the arguments for the distinctiveness of Ulster-Scots (ie as separate from "mainland Scots") is that over many hundreds of years Ulster-Scots has had a strong influence from the Irish language. And the picture here is what has triggered this post. The humble spud. 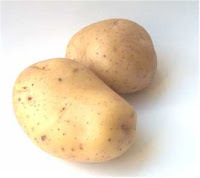 My parents, my grandparents, and probably their ancestors for generations before them, always called "potatoes" "prootas". There was the occasional reference to "tatties" (which is of course Scots), but 95% of the time it was "prootas". So just today I decided to look up "prootas" in the 6 or 7 Scots language dictionaries I have. Wee yins and big brutes o yins. And not a single mention of "prootas" anywhere!!! - I will always call a potato a "proota" and not a "tattie". - I also call children "weans" and not "bairns". - I say "yin" but never "ane". - I never say "fit like" (which is a very popular figure of speech in NE Scotland). This is an experiment to see if I can post audio files to the blog. May as well use a superb song for you to enjoy - it's an old traditional Gospel song. Elvis recorded a fairly upbeat version on his 1966 gospel album "How Great Thou Art"with the name "Run On". This version was recorded by Johnny Cash just before he died on Sept 12 2003, and is featured on his final album "American V: A Hundred Highways". It's not far short of terrifying. "...You can run on for a long time.. but sooner or later God's gonna cut you down..."